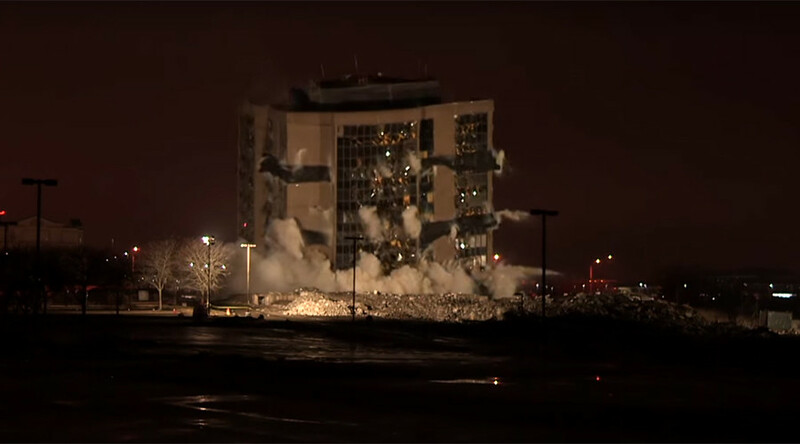 An epic building demolition in Kansas has been filmed in all its destructive glory by onlookers who gathered to watch a 1972 office block being blasted to smithereens. The 10-storey CenturyLink structure which was once the workplace for hundreds of people, was reduced to a dusty pile of rubble in just five seconds. Demolition teams planted explosives on the Johnson County business park building to ensure a safe and successful implosion. According to Kansas highway patrol, sections of the nearby Interstate 435 had to be closed during the Sunday demolition. The demolition saw the implosion technique used for the first time at the site, which is undergoing redevelopment, the Kansas City Star reports. Razing the 1970s structure makes room for a new commercial building called Overland One. The construction company behind the redevelopment released footage of the dramatic implosion. It reveals the devastating impact of the explosives on the large concrete office block, which disappears in a cloud of earthen dust. Witnesses to the demolition also posted their own footage of the event. One amateur clip, filmed from a nearby car park, provides a closer glimpse of the mini explosions being triggered up the side of the building. Drone footage by Industrial & Wrecking also shows the sheer scale of the commercial building.